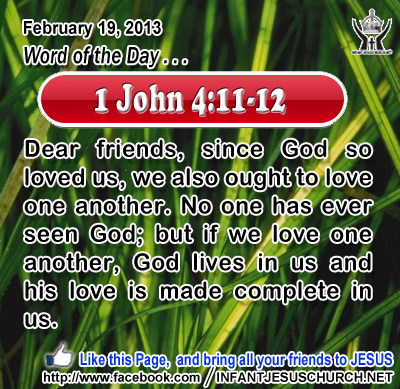 1 John 4:11-12: Dear friends, since God so loved us, we also ought to love one another. No one has ever seen God; but if we love one another, God lives in us and his love is made complete in us. Heavenly Father, it is so comforting to know that you are not far away - that we live in you and you live in us. Help us see others with your eyes and react to their needs with your heart so that your love may be complete in us. In the name of Infant Jesus we pray. Amen. 7"And in praying do not heap up empty phrases as the Gentiles do; for they think that they will be heard for their many words. 8Do not be like them, for your Father knows what you need before you ask him. 9Pray then like this: Our Father who art in heaven, Hallowed be thy name. 10Thy kingdom come. Thy will be done, On earth as it is in heaven. 11Give us this day our daily bread; 12And forgive us our debts, As we also have forgiven our debtors; 13And lead us not into temptation, But deliver us from evil. 14For if you forgive men their trespasses, your heavenly Father also will forgive you; 15but if you do not forgive men their trespasses, neither will your Father forgive your trespasses. Today’s Gospel we see Jesus teaches how to pray. We can approach God confidently because he is waiting with arms broad open to receive his prodigal sons and daughters. That is why Jesus gave his disciples the ideal prayer that dares to call God, Our Father. This prayer teaches us how to ask God for the things we truly need, the things that matter not only for the present but for eternity as well. We can approach God our Father with self-confidence and boldness since Jesus has opened the way to heaven for us through his death and resurrection. When we ask God for help, he luckily does not give us what we deserve. Instead, he responds with grace, mercy, and compassion. He is good and forgiving towards us, and he waits for us to treat our neighbor the same. Heavenly Father, you have given us a mind to recognize you, a will to serve you, and a heart to love you. Give us today the grace and power to embrace your holy will and fill our heart and mind with your truth and love that all my purposes and actions may be pleasing to you. Help me to be kind and merciful towards our neighbor as you have been towards us.